15th anniversary edition of the legendary VoxBox in a limited edition finish. Celebrating the 15th anniversary of the VoxBox, this smash hit-maker has been handcrafted in black and blue, complete with certificate and signed by EveAnna Manley. Only 50 will be issued. Use Manley's art to sculpt your music and enjoy the dividends. When Manley created the VOXBOX Combo voice processor they decided to pull out all the stops and make a truly professional high-end statement. One that covered the needs of the project songwriters and big-time major studios alike. One whose all-tube signal path could bring every instrument and overdub to life. One that, plain and simple, sounded unquestionably better than the rest, provided flexibility, simplicity, and thought-out ergonomics. Microphone preamplifier section : The mic preamp is a clone of a highly regarded and popular mic pre: the Manley Mono Microphone Preamplifier! The mic input transformer is Manley's own design wound in-house at the Manley Labs factory. High current 48V Phantom power is switchable from the front panel. A simple and effective passive BASS CUT switch kills rumble and reduces popping. The VOXBOX's INPUT ATTENUATOR is a variable pad control situated before the first tube stage allowing the preamplifier to accommodate +4 line level signals via the balanced LINE INPUT and instruments via the front panel 1/4 DIRECT INPUT. These inputs are selected in the middle position of the dual-function phase invert switch. The Gain switch is actually a clever variable feedback control that changes not only the gain but the slew rate and flavor of the circuit. With it you can choose how laid back and mellow or how up-front and aggressive you want it to get. See "Notes on Variable Feedback" for more info. Headroom is a strong point in this circuit, +31dBu capable. This is 5 to 10 dB better than almost all other pro gear. The music passes through only super-clean pure Class A vacuum tube circuitry. There are obvious advantages to Manley's purist approach and foremost is the non-electronic final sound that carries emotion into the digital realm. Manley figured out how to compress the signal before it hit the tubes with no detrimental effect on distortion or frequency response. This way, it can prevent mic-pre clipping and eliminate whole stages of electronics. This cuts the typical path of mic to tape in half! Manley also pioneered new thinking in the sidechain. Rather than compromise, Manley developed a technique of using up to four different time constants simultaneously and controlling them with familiar simple attack, release and threshold controls. Manley call the approach "Parametric Compression". Manley developed optimum settings or presets based on the Light Dependent Resistors of Manley's own fast ELOP Limiter, the quick LA-2A, the slower LA-3A and then created more complex special settings. This extended range and method of timing delivers fresh sounds from powerhouse punching drums to super-solid bass yet can also emulate the way good engineers delicately ride a fader while recording. It is transparent and liquid-smooth on vocals, easy to use and accurate. 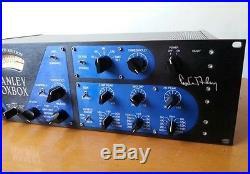 Also rare for an opto-based dynamic processor, this compressor works great on mixes. Of course, you'll be needing two VOXBOXes linked in stereo. EQ section : Lots of folks requested that Manley include the Pultec Mid Frequency Equalizer in the VOXBOX, but they wanted more… Now Manley extended it to 33 frequencies in 3 bands with 6 new frequencies from 20 Hz to 150 Hz, and 6 more in the highs from 6.4 KHz to 20 KHz. Ever notice that only EQ's with real inductors have the bottom end magic or that only Class A circuitry can keep the top end set? The EQ INPUT switch patches in the Line Input, Preamp Output, or the INSERT return. This switch serves double-duty acting as a bypass switch for the preamp and/or external processors or for processing two different tracks. De-esser/Limiter section : The VOXBOX combo also includes a de-esser & peak limiter based on Manley's original ELOP Limiter design but with an added passive LC network to handle the de-essing four carefully chosen notch frequencies from 3KHz to 12KHz. That 3KHz setting really tames those annoying frequencies! The fifth position gives you a limiter which totally mimics the famous LA-2A. This means the signal processor lets you both compress pre-EQ then limit here post-EQ. Another cool feature is the ability to insert this de-esser silently and smoothly as the music plays, using it as needed. 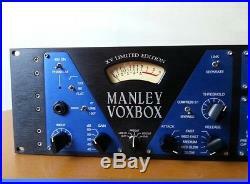 The Manley VOXBOX's meter is a full size illuminated Sifam VU meter. A five-position switch shows three audio levels: the line input, the preamp output and the final output. It also shows compressor gain reduction and the de-esser/limiter action. Other clever innovations incorporated into the Manley VOXBOX combo include warm-up muting circuitry, extensive magnetic field containment,'smart-grounding', and silent switching. The sum-total is more than the separate parts: consider the reduced patching, the short path to tape and you having this much immediate control. The VOXBOX also works extremely works on other instruments besides voice. There are some great settings for drums, bass, guitar, and keys and the two separate sections can be used together or independently. Manley couldn't resist planning for that as ll. There are Stereo Links for both the compressor and the De-Ess/Limiter sections, special compression settings and super-set EQ frequencies for your mix or pre-mastering. With most "normal" condenser mics and applications, the GAIN switch setting can be chosen at will for sonic variety for a "more tube-y" sound in the lower 40 or 45dB settings, straight-forward sounding middle positions, or more aggressive punchy sounds in the higher gain positions. There is no right or wrong with this switch. Have fun playing around with itit will bring you some interesting results. Limited edition anniversary edition in black and blue. Includes certificate signed by EveAnna Manley. Manley transformers with nickel laminations in mu-metal cases. 2 Kohm mic input z with high current 48v phantom power built-in. Hi-Z (100K) direct instrument input. Line & insert inputs (balanced XLR & ¼). Preamp & eq outputs lo-Z (50w). Stereo link for compressor & de-esser/limiter. Side chain monitor for de-esser. Large illuminated sifam meter with five readout modes. VOXBOX® Combo XV Limited Edition. Signal to Noise Ratio: 113dB. Tube complement: 12AX7LPS and 6414. Signal to Noise Ratio: 116dB. Tube complement: 5751 and 6414. Attack Times: 4mS to 70mS. 5, 1, 2, 5 Sec. De-Ess Notch Frequencies: 3, 6, 9, 12KHz, none (LIMIT). Mains Voltage Frequency: 50 60Hz. Dimensions: 19" x 5.25" x 10 (occupies 3U). 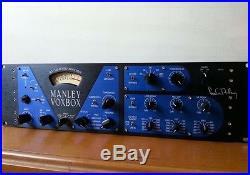 The item "Manley VOXBOX Channel Strip with Class A Microphone Preamplifie" is in sale since Sunday, May 21, 2017. This item is in the category "Musical Instruments & Gear\Pro Audio Equipment\Preamps & Channel Strips".